On 3rd July, Malta's historic buses will be replaced by a modern fleet of Arriva buses, under the banner of Transport for Malta, or TfM. The unique owner-operator system is ending, whereby drivers have owned, and in many cases, built, or inherited from their fathers - their own buses. They have been responsible for running and maintaining them, but on 3rd July a fleet of brand new vehicles will send many of the old buses to the scrapyard. Arriva have won the contract to operate the new buses on the islands and are busy making arrangements for the changeover, which will include driver training on the new vehicles. All owner drivers who have operated the old buses have been offered compensation and the chance of a job driving the new buses and some older drivers have been offered voluntary retirement. Many UK enthusiasts have visited the island this year in order to experience the final few months of operations and we have shown some of their pictures on the Focus website. Some of our regular visitors to Focus are scheduled to be on the island at the time of the handover and it is hoped to bring you pictures of the change from old to new in due course. The new vehicles are being supplied by King Long and Optare. 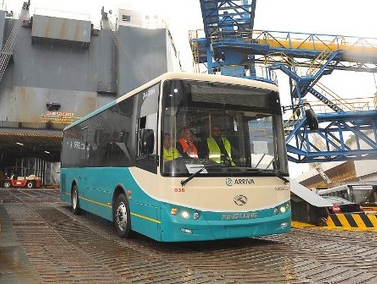 One of the new Euro 5 King Long vehicles is seen here being unloaded in Malta. The Optare Solos are 28-seat 8.8-metre models and will be used on services in Valletta, the island’s capital. Arriva has specified the 2.3-metre wide ‘SlimLine’ model to cope more easily with local operating conditions including Valletta’s many narrow streets.